Our thanks to Kipper McGee, who contributed these recordings as PD for WLS - The Big 89.
. . . We're a lot more than breathtaking eyecandy, Tommy . . .
Memorial Day (May 26) 2008 was the date for the second and last BIG 89 REWIND. This exhibit is a composite of two hours: Larry Lujack and Tommy Edwards from 10 AM to 12 Noon. This was the last time Edwards and Lujack were heard together on WLS. Featured: Larry and Tommy read and comment on listener messages, provide a generic Commencement address and an Address To The Nation as well as a special edition of Animal Stories. 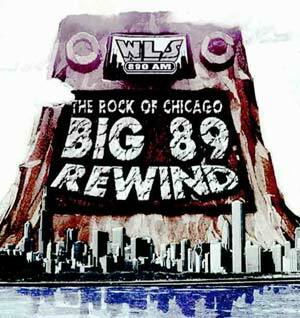 REELRADIO previously streamed the entire BIG 89 REWIND of 2008 broadcast on July 4, 2008. Larry Lujack died of esophageal cancer on December 18, 2013. He was 73.